New York, NY – KupperMounts.com, a leading-edge, vacuum suction-cup bicycle vehicle rack manufacturer, announced as part of its crowdfunding campaign it is once again offering an opportunity to buy their popular vehicle bicycle racks at a 50-percent discount off their retail price of $199. The bicycle racks will be offered with Early-Bird discounts as low as $89 via the Kickstarter crowdfunding campaign, which lasts from March 5, 2019, until April 18, 2019, and can be purchased at https://5cd03312.kckb.st. Offering 450 pounds of vacuum-suction power, Kupper Mounts, the bicycle industry’s largest 9″ UV-resistant, maximum-grip rubber suction cups, are loaded with features and benefits. Its 9″ and 6″ flexible-mounting cups and its compact size make it great for travel. 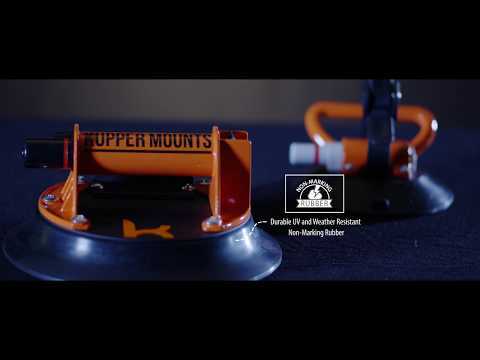 Unlike other bike racks that require an expensive trailer hitch or a luggage rack, Kupper Mounts can be mounted on any vehicle, anywhere in the world. The strength and durability has been tested by leading biking gear publications such as GearJunkie which gave Kupper Mounts bike racks an in-depth product test and wrote the following article: Suction Cup Bike Rack – Testing the Safety of Kupper Car Mounts. Over the past 12 months, Kupper Mounts has and continues to build a network of independent sales reps and domestic/international distributors to deliver Kupper Mounts bicycle racks to bike shops, retail locations and bicycle customers throughout the United States, Canada, Greece, Mexico, Australia, Austria, Belgium, Brazil, China, Denmark, Finland, France, Germany, India, Indonesia, Ireland, Israel, Italy, Japan, Netherlands, Norway, Philippines, Poland, Russia, Slovenia, South Korea, Spain, Sweden, Switzerland, Ukraine, United Kingdom and other international markets. In addition to consumer pricing for the Kickstarter campaign ranging from $99 to $199, attractive pricing is being offered to bike shops and high-volume independent bike dealers (IBD) in 10-packs for $990, 20-packs for $1,850, pallets (72-units) for $6,500 as well as container-based pricing. in the United States or the Rest of the World? See Our Updated 2016 Rankings! United States – We have updated our List of the Top 100 Global Crowdfunding Sites for 2016 in the United States, Europe, Asia, South America, Africa and other global markets. Clicking on the website traffic ranking links below will take readers to one of the most insightful resources of information that details each website’s traffic ranking; the number of unique visitors per month; the average time spent on each site per visit; and the number of pages viewed per each visit. Of more interest to crowdfunding campaign managers will be the precise ratio of social media, content marketing, search engine marketing, email marketing and display advertising that is being utilized by each crowdfunding site’s marketing campaigns to drive readers and investors to their crowdfunding profiles. Even though these numbers reflect the aggregation of all of a given portal’s crowdfunding campaigns marketing efforts, they offer direct evidence of what is working and what is not. Note the difference on how much social media and display advertising is being used by the Top 10 Crowdfunding Sites compared the lower 90 crowdfunding sites. This information can be used by crowdfunding sites as well as their crowdfunders to get a thorough understanding on how to plan future marketing campaigns that will have a higher than average success rate. Want to know how Kickstarter has just retaken GoFundMe as the world’s #1 crowdfunding platform? Click on the Global Rank number links below and then use the comparison tool to show side-by-side comparisons of SEO keywords, link referrals, and social media usage. See the bottom of the page for more crowdfunding marketing tips. Crowdfunding PR’s goal is simple. We want to make it possible for crowdfunders to shop for crowdfunding platforms in a similar manner to the way media planners/buyers used to analyze ABC and BPA audit statements to buy advertisements in the business-to-business trade publication industry, where important media buying decisions were based on straight mathematics, not popularity or random guessing. For example, would you rather run a crowdfunding campaign on a site where visitors are looking at 2-3 pages in around 3 minute’s time or a site where buyers are spending 6 to 11 minutes reviewing 6 to 10 pages? This is the difference between shoppers who are visiting a site to see a particular crowdfunding campaign based on a marketing campaign versus people who are visiting a site to explore and actually shop around to find good deals to buy or invest their money. This is why launching a campaign on Kickstarter or GoFundMe does not guarantee success. While Kickstarter, GoFundMe or Indiegogo may be the largest sites in the world, people are only spending enough time to shop through more than 2 to 3 crowdfunding profiles before they exit. While other sites like Razoo.com, DonorsChoose.org, and FundingCircle.com have visitors that stay more than 6 to 11 minutes and view 6 to 10 pages. When researching, planning and executing successful marketing programs for both crowdfunding platforms as well as their individual crowdfunding customer profiles, it is extremely important to see what is driving the most traffic to any given crowdfunding site. Success is usually determined not only by what site the crowdfunding campaign is being hosted on, but also the marketing programs being harnessed to drive potential donors/investors to a specific crowdfunding profile. Clicking on each link above will allow media planners/buyers to understand what role direct traffic (content marketing), search engines (SEO, PPC Advertising), social media (Facebook, LinkedIn, Twitter, Reddit, Quora), email marketing and display advertising (Google Display, Outbrain, AppNexus) are having on the success of crowdfunding campaigns. For example, when planning a social media strategy, one of the most popular questions we get asked is – what social media networks are driving the most visitor traffic? Facebook, LinkedIn, Twitter, Quora, Reddit, YouTube, Pinterest, Instagram? The links above will make this answer crystal clear. Not satisfied with your position on the list? Front Page PR’s team of crowdfunding PR, social media and marketing experts can help crowdfunding sites and crowdfunding campaigns plan the perfect mix of integrated marketing programs to significantly improve the amount of website traffic being driven to any given fundraising campaign or crowdfunding platform. Feel free to call (512) 627-6622 with questions or request help to improve your website statistics before June. If you’d like to add your site to the Top 100 list, please fill out the form below. Los Angeles, California – Crowdfunding is accelerating at an unprecedented rate and impacting government policy, informing enterprise innovation, and changing the role of financial institutions around the world. Massolution, the leading research firm in world that specializes in reporting on the growing crowdfunding industry, released its annual 2015CF – Crowdfunding Industry Report. After collecting data on 1,250 active crowdfunding platforms (CFPs) worldwide and undertaking significant further research, the results reveal that CFPs raised $16.2 billion in 2014, a 167% increase over the $6.1 billion raised in 2013. North America still accounts for the largest market but 2014 saw Asia overtake Europe, by a small margin. With exponential growth in Asia, Massolution forecasts this lead will increase significantly in 2015 with the delta between Asia and Europe increasing to over $4 Billion. The report predicts that Europe’s 20.1% of market share in 2014 will decline slightly in 2015 when Europe will account for 18.8% of the worldwide market. North America retained its market lead in 2014 but Asia topped Europe to become the second largest region by funding volume. The growth in funding volumes continued to be primarily driven by lending-based crowdfunding, but significant annual growth in equity-based crowdfunding and increased adoption of newer hybrid and royalty-based models indicates that the allocation of funding volume across different models will be more highly distributed over the coming years. The 2015 – Crowdfunding Industry Report is a research report that provides a unique and in-depth analysis of crowdfunding market size, composition, trends and composition. The Crowdfunding Industry Survey, to which Massolution received 463 high-quality responses, was conducted during late 2014 and early 2015 and resulted in the most comprehensive data collection on the worldwide crowdfunding market to date. Massolution has conducted significant follow-up research via other reliable channels to complete the profiling of the global crowdfunding industry. Spain – Crowdcube opened its Spanish operation just nine months ago. Since it launched, over €1 million has been raised by its investor base who can invest anything from €10. The largest investment to date has been €112,000 and the average investment €3,290. The finance raised has funded six businesses operating in a range of sectors including food and beverage, finance and business services. One of the businesses to raise finance on the platform was HEMAV, a Barcelona-based drone company, which broke the record for the largest equity crowdfunding round in Spain. The company raised €450,000 in just six days after attracting investment from more than 70 people. The most recent business to successfully raise investments on the site was Zank, a peer-to-peer lending platform, which raised €245,000 from over 70 investors. As part of the round, the company also received funds from ESADE Ban, the business angel network of the ESADE business school . Zank was the first lending platform in Spain to secure funding through crowdfunding. Crowdcube Spain has also raised investment for, Iberic Box, a company that sells traditional Spanish food; Eureka Startup Experts, a marketplace that connects entrepreneurs with advisors and industry experts; FoodintheBox, a subscription box service for cooking ingredients; Seedbox, a subscription box for growing vegetables at home. There are currently eight businesses on Crowdcube Spain pitching for a total investment of €995,000. Crowdcube Spain is one of seven partnerships in Crowdcube’s overseas operation, the company now has platforms in Brazil, Sweden, Dubai, Poland, Italy, Spain and New Zealand. Austin, Texas – Want to know who the Top 100 Fastest Growing Crowdfunding sites in the world are? The graph above shows the top 10 crowdfunding sites based on their website’s internet traffic. From a competitive analysis standpoint it might make you wonder how these companies are growing at such a phenomenal rate. What type of marketing campaigns are they running to achieve this success? Advertising? Email Marketing? Affiliate Marketing? Referral Partners? Direct Traffic? Search Engine Results? Alexa provides a little bit of information, Compete has even less, but SimilarWeb is building a great business by providing a ton of competitive information that up and coming crowdfunding sites and crowdfunding campaign managers can use to improve their marketing efforts. Want to see the competitive analysis marketing report for each of the sites below? Simply click the % link for each one and you’ll be able to see what type of marketing campaigns are driving these sites’ traffic, where that traffic is coming from, where their visitors are going next, plus a whole lot more. For examples, scroll down to the bottom of this page to see what types of marketing programs are driving the top 10 crowdfunding site’s rapid acceleration of website traffic. 1st – Follow @Crowdfunding PR, click here to send a Connect Request via Linkedin, or do both. 4th – Want to improve your crowdfunding site’s results/ranking? Call us at (512) 627-6622. Front Page PR will put together an aggressive marketing program to improve your competitive position! Click on the web site traffic links below to research potential crowdfunding websites and their ability to reach your crowdfunding PR campaigns desired target audience. If your site is not listed, feel free to contact us and tell us why your site should be listed. If you need help putting together a crowdfunding marketing campaign for your crowdfunding website or crowdfunding campaign, feel free to contact us. We also maintain the world’s largest database of crowdfunding service providers. Many readers first visit the Crowdfunding Press Center to learn more about the booming crowdfunding industry and try to get a handle on how to select the best crowdfunding website to launch a fundraising campaign and learn what it takes to plan a successful crowdfunding campaign. Launching a crowdfunding campaign is nothing more than a fancy way to describe a typical product/service marketing launch. The only real difference between a crowdfunding campaign and an old-fashioned product marketing/PR launch is the time period for collecting money. In the past, companies have created new products, built company websites and used marketing, advertising, social networks and PR campaigns to raise awareness among the correct target audience to entice new/existing customers to buy their product or service. eCommerce or the process of collecting money online is nothing new. Collecting money or pre-selling a product/service, however, is a totally new concept and seems to be working very well. Marketers love it because they can actually test demand for a product or service prior to investing a lot of time, effort and money to bring a product to market. If a crowdfunding campaigns fails, entrepreneurs will actually save a lot of money that would have been invested in a new business that probably would have failed in a couple of years. If the crowdfunding campaign is a successful and you raise several million dollars, you can bet that venture capitalists and angel investors will be very interested in buying equity stock the old fashioned way. The one question that everyone wants to get answered is what is the best crowdfunding website to utilize when launching a fundraising campaign. The answer is simple. Like advertising or generating publicity in any communications medium, the most important question to answer is who is the desired target audience of donors and what kind of demographics/psychographics can be utilized to create effective marketing messages to convince the masses to donate money to your cause, creative project or new business idea. Once the target audience has been identified it is easy to target media usage patterns to find the right mix of media outlets needed to achieve both reach and frequency to reach the correct target audience with the perfect message for the lowest cost -per-thousand (CPM). This is how marketeers have been conducting marketing campaigns for almost a century. In today’s world, reach and frequency is tied directly to search engine optimization (SEO) and social networks along with traditional media outlets. To help marketing/PR executives as well as crowdfunding campaign managers discover this type of information, we have analyzed what we consider to be the top 100 crowdfunding sites worldwide. We ranked crowdfunding websites by their global website traffic as well as numerous other analytics including traffic stats, search analytics, audience readership, reviews, backlinks and upstream/downstream websites generating traffic. It will not take long before media reps, media outlets and website auditing companies jump into crowdfunding market to start providing in-depth research reports, crowdfunding website audit statements and other readership studies that detail their website’s ability to reach the desired pool of investors/donors via their crowdfunding platform or website. Austin, Texas – Thinking about launching a Crowdfunding campaign to raise money to fund your creative business idea and bring it to fruition? The Crowdfunding Press Center provides regular news reports on new Crowdfunding sites that have opened their doors to help entrepreneurs and small businesses launch fundraising campaigns to help bring their ingenious business ideas to fruition. The big question that most crowdfunding campaign managers want to know is what crowdfunding site is the best to launch their fundraising campaign? Kickstarter vs. Indiegogo, which crowdfunding site is better? Or would one of the other crowdfunding sites outlined below be a better match for their precise crowdfunding goals and objectives.